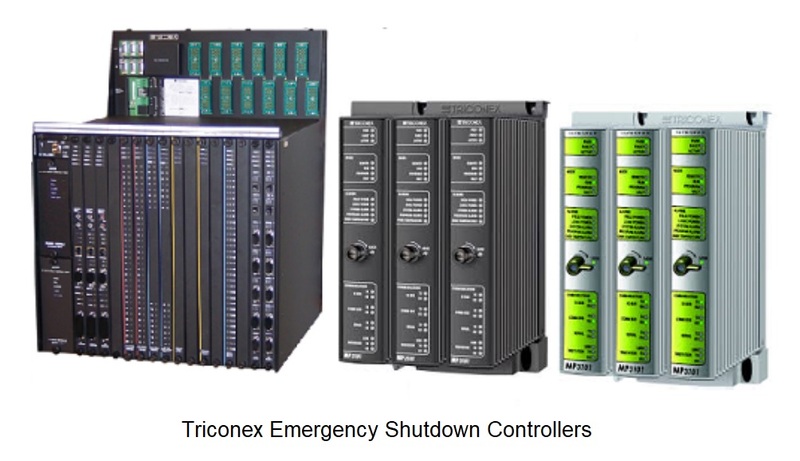 The name Triton comes from targeting the Triconex safety controller model it attacks. The first Triton malware attack on the Saudi Arabian plant was just the beginning. There have recently been signs that Triton and the hacking group behind it is on the move, researching global targets that include North America. It’s the industries that Triton can target that keeps cybersecurity professionals up at night–security systems for water treatment facilities, transportation grids, and even nuclear power plants. This killer code attacks and disables safety systems in place to prevent industrial accidents that can have catastrophic and deadly results on the human population both near and far. Researchers have seen evidence that Triton’s hackers are creating new strains of the malware, designed to widen the scope of the attacks to include even more industrial failsafe mechanisms. Since its debut in 2017, cybersecurity specialists have been scrambling to deconstruct Triton and expose who is behind it. It was discovered that the malware had been in the plant’s network for three years prior to the attack. Flaws in security procedures led the malware to access its safety control network and memory. It was also discovered that plant workers had left physical keys controlling the Triconex system control settings in a way that allowed hackers remote access. 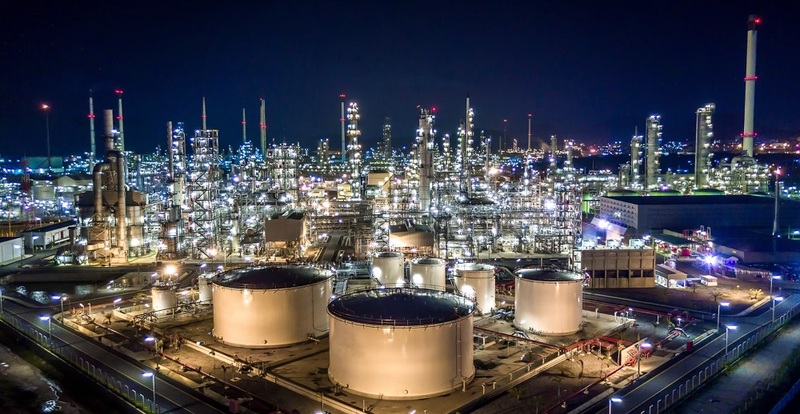 The petrochemical plant also ignored antivirus alarms that Triton malware triggered, as well as failing to find unusual network traffic. These security findings about how Triton works led to revelations about just how vulnerable failsafe mechanisms–and the industries that use them–are to manipulation and disaster. Cybersecurity experts agree the growing connectivity between systems–the industrial internet of things–is a phenomenon that leaves the world wide open to more malware attacks like Triton. Those connections give hackers more potential targets, and the increased ability to put lives in very real danger. Until Triton, security professionals believed that targeting safety systems was something even hackers wouldn’t do, also citing the incredibly difficult task it is to create. Triton malware brings hacking to a deadly level never before seen and puts to rest the idea that hackers aren’t dedicated enough to create it. Many believe government actors are behind Triton, including Russia, North Korea, and/or Iran. Although the question of who created Triton is critical, it’s clear that bolstering infrastructure systems is an expensive but necessary investment for the world at large. With human life literally on the line, another question undoubtedly includes the consequences if these investments are not made. Email phishing has long been the hacker’s gold-card of success. One important part of keeping secure is taking additional steps to verify your identity when shopping or banking online, or simply logging in to any online account. One of the most useful tools for an identity check is using 2-Factor Verification (2FA). It provides added steps to verify your identity as part of logging in to an account. It’s been around a while and is a simple and direct way of taking an additional security precaution–until now. 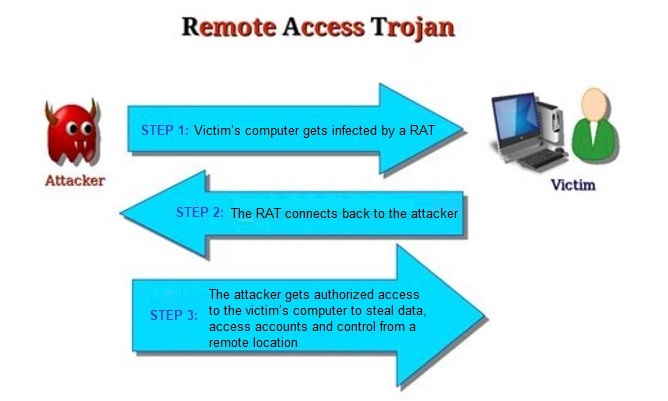 Security researches recently discovered a way hackers can get to your of 2FA steps in a way that gives them access to your accounts and you don't even know they were there. Training and cybersecurity education have helped reduce email phishing attacks, but this latest hack tricks users into providing their passwords by pretending to be that extra 2FA step you count on for online security. Through its trickery, socially engineered phishing campaigns are now more successful than ever. Hackers present a web site designed to be the spitting image of the login page you expect to see for your account. But rather than just crafting the website to look like your legitimate site, a bypass tool being called Modlishka actually pulls the real content from the actual website so that it’s identical to what you expect. That’s the scary part. Then, through a series of bogus transactions designed to appear to be what it’s not, users don’t realize their 2FA has been compromised. Once they hackers get what they want, they pass you on to your intended website. Although 2FA doesn’t guarantee safety from phishing hacks, as this instance demonstrates, it still gives a second layer of comfort toward that end. It should always be used when it’s provided as an option for your online accounts. Something to verify the user’s biometric identity, using fingerprints, eye retina, or voice acknowledgement. 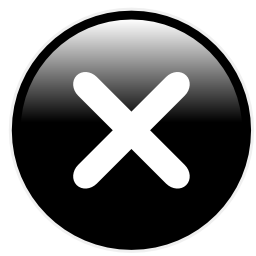 If you are not expecting links or attachments in an email or text, don’t click them. If you notice typos, misspellings, or incorrect grammar, be very suspicious. If they email states something that tries to “scare” you into taking quick action, immediately stop and think first. Then, contact the sender independently before clicking. The financial institution or retailer will appreciate being alerted to nefarious activity involving them. If it is legitimate, they will let you know that too. Do a quick check of the URLs for important websites before entering personal information. Be 100% certain it’s where you want to be. Before clicking anything you’re not certain about, do an independent verification by calling the sender before clicking. Be sure to use a number from a website you know is the right one or that you already have saved. Don’t use information sent in the email. If any website offers 2FA or MFA, don’t hesitate to use it. Although they may not be the absolute security guarantee you hope for, any additional verification steps are always recommended. Cybercrime is a worldwide threat facing us all, no matter where in the world you’re from. The European Union’s (EU) law enforcement intelligence agency recently released a report naming their top forms of cybercrime. The 2018 Internet Organized Crime Threat Assessment takes a look at the most prevalent types of cybercrime in the EU. However, there’s every reason to believe these cybercrimes are rampant in the U.S. as well. As far as cybercrime trends, the report finds earlier editions of crime are still around but are very much improved. The report finds “Many areas of the report...build upon previous editions, which emphasizes the longevity of the many facets of cybercrime.” Fasten your seatbelts. We’re in for a bumpy ride. Ransomware and malware - Although the growth of ransomware attacks may be slowing, they’re still prevalent, especially by nation-state actors. Targeted malware along with malvertising shows no signs of slowing down. Data breaches - Considered a prominent threat. Attacks on businesses are growing while attacks on consumers are slowing. 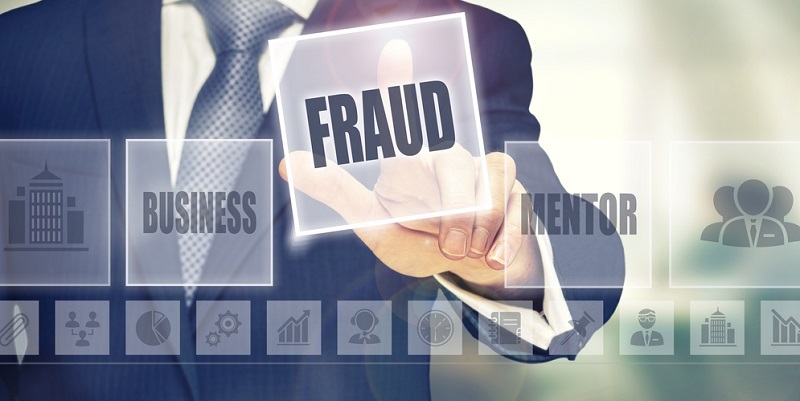 Data stolen from finance and corporate could mean an increase in selling data or blackmail. Online child sexual exploitation material - Increasing amounts of online child sexual exploitation material, with more extreme material found on the Dark Web. Sextortion - With more children gaining access to the Internet, the risk of sexual coercion and extortion continues to grow. Distributed denial-of-service attacks - When multiple compromised systems combine to target a single system, they cause a denial-of-service. 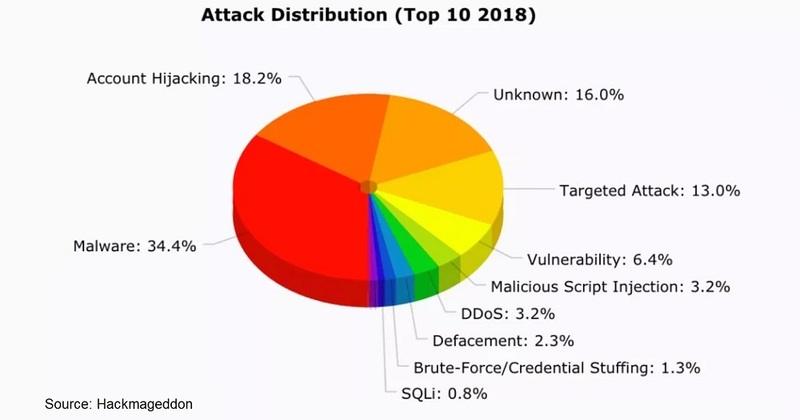 The attacks persist because they mean low risk of being caught, low cost, and are more accessible. 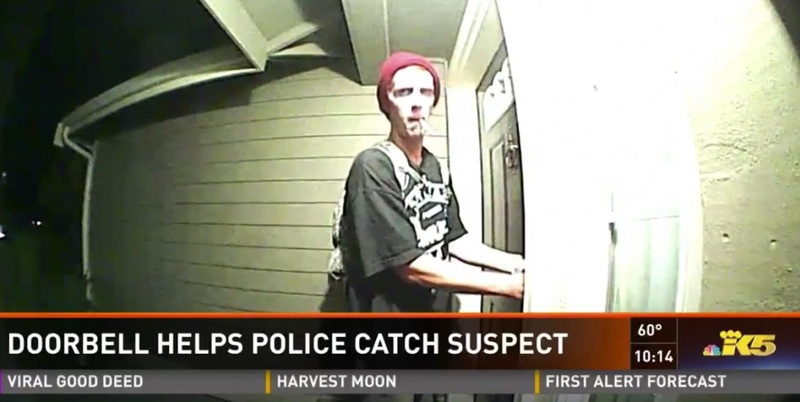 Payment card fraud - Skimmed credit card data and card-not-present fraud continues. Card information is easily sold on the dark web. Cryptocurrency - The electronic currency is facing hacking, theft, and extortion of personal data. It’s growing use may alter the threat environment overall. Cryptojacking - Stealing power from devices to mine for cryptocurrency is on the rise. It’s easy to do, along with getting the necessary tools. Cryptomining malware may also see growth. Bitcoin popularity - Although other cryptocurrencies are available, bitcoin continues to be the prevalent form of cryptocurrency found in cybercrime. Social Engineering - Email phishing continues as the most frequent type of social engineering. Telephone phishing (vishing) is second to email, and SMS (smishing) tactics are least frequent, though still prevalent. What can we do? 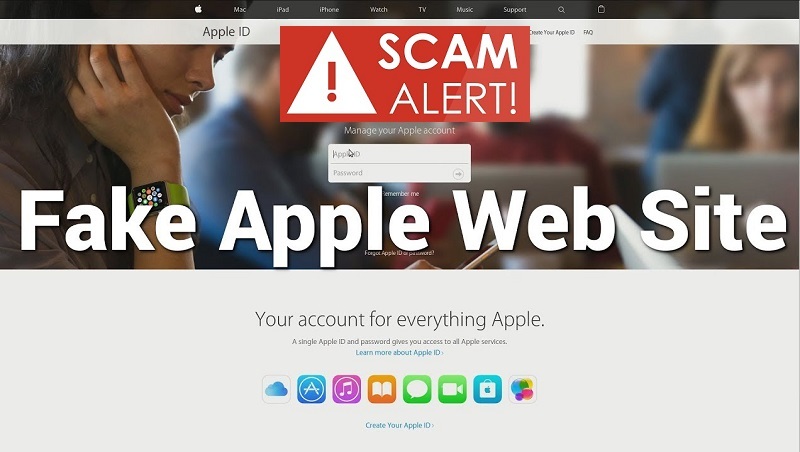 In most cases, watch for phishing email, vishing, and smishing. Many of these cybercrimes are successful because we click links or attachments that we aren’t expecting to receive, or that are from unknown persons. Just don’t let curiosity get the best of you. Always confirm if you just cannot be sure. It’s worth the few extra minutes. 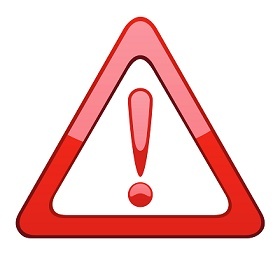 As for anything shared online, the best we can do is use extreme caution when posting information and especially photos. Yes, sharing moments on social media is special. However, keep in mind that whatever you put online should be considered available for public consumption, no matter how strong you set the security and privacy settings. Once you share something, you lose control over where it goes next and it can potentially be used against you. Share, of course. Just use caution. It’s welcome news and couldn’t arrive too soon. 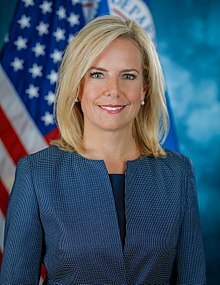 The Department of Homeland Security announced the creation of new legislation called the Cybersecurity and Infrastructure Security Agency (CISA) bill. It also includes the creation of a new government agency by the same name–CISA. The legislation, passed by the Senate in October of this year, was recently signed by the President and is responsible for the daunting task of providing both cyber and physical security for the US. “(iii) understand those threats in light of actual and potential vulnerabilities of the homeland. All of this is good news as we’ve seen intrusions on many government agencies in the past and due to the information that’s stored on the systems and the outdated systems many of them still use today. A new version of a ransomware that can evade detection has been seen in a new and improved state by researchers at Kaspersky Labs. It came onto the scene last August, but is rearing its ugly head again; now with more dangerous results. A SynAck variant is now using a technique called Process Doppelganging to make it appear as if it’s a version of a legitimate process already on the machine, but it's actually doing something malicious. 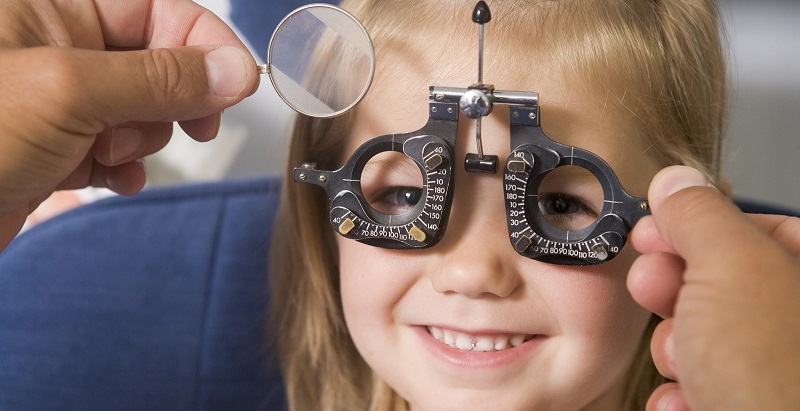 This technique makes it virtually impossible to detect. In fact, the only way you may know your computer is infected is when you notice the ransom note. SynAck is the first ransomware detected that uses Doppelganging, so far. But that isn’t the only thing that makes it dangerous. It can detect if it’s being launched from a sandbox (a virtual space disconnected from the rest of the network) and if so, it will exit without a trace, leaving everyone none-the-wiser. 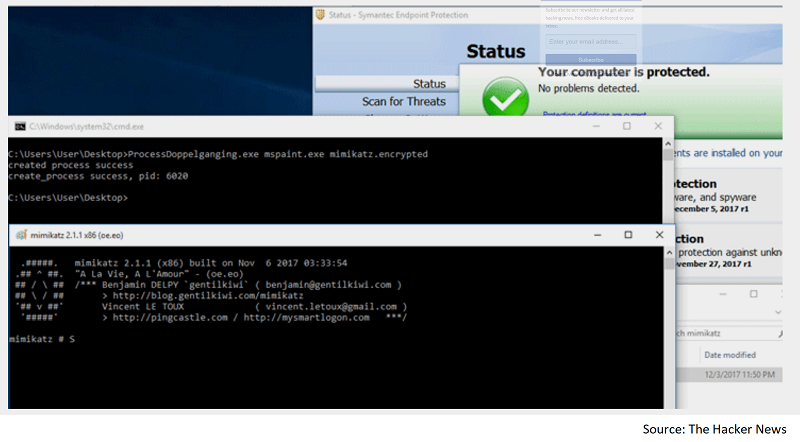 Tal Liberman, the head of the research team at enSilo used Mimikatz, a post-exploit tool that helps steal credentials from infected computers, to test Process Doppelganging againt various antivirus products runninig on different versions of Windows. 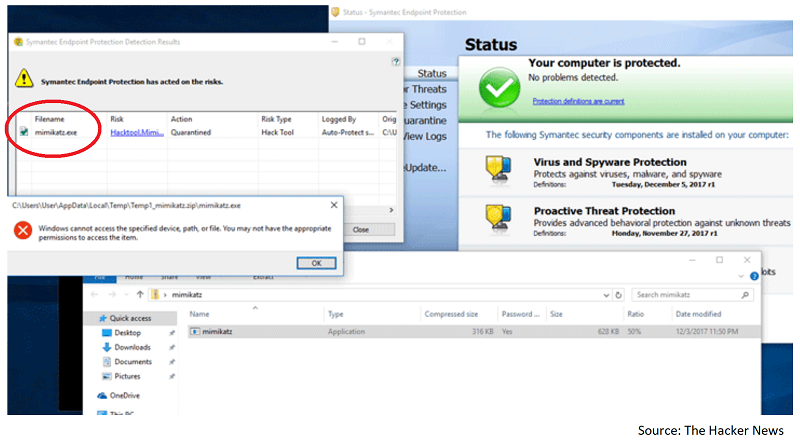 When running the malware on a Windows computer on its own, Symantec caught the malware right away. For Liberman's second test, he ran Mimikatz with Process Doppelganging, and the results were much different. Symantec was not able to detect the malware infection. 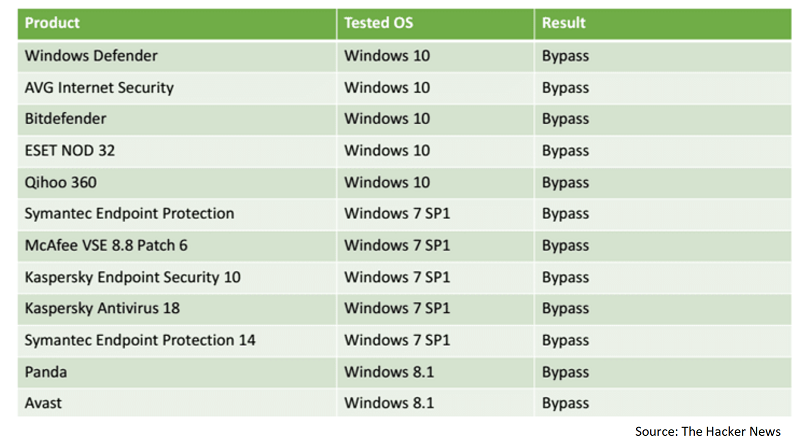 Symantec was not the only software unable to detect malware infections when using Process Doppelgangin, the below chart shows all the products tested and particular version of Windows used for the testing. Of course that is not all, but suffice it to say that it’s a bugger and as far as can be determined, it makes its way into the network via RDP, or remote desktop protocol. 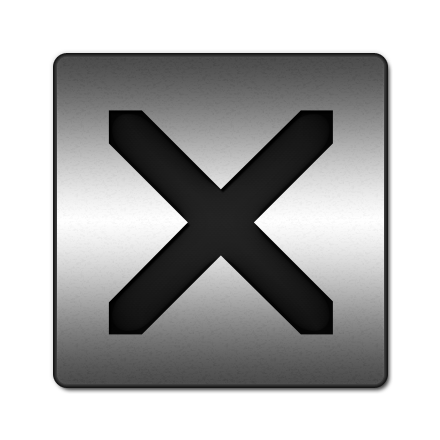 This tool allows remote access to another machine. Often it’s used by IT departments to troubleshoot an issue on an end user’s computer so a person doesn’t have to have physical access to the computer. 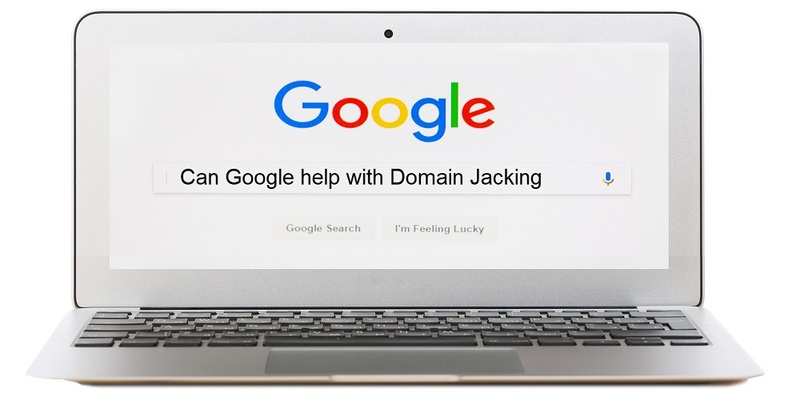 It may also be used in scams such as the infamous tech support scam, where a person will call on the phone and tell you something is wrong with your computer. That person will then happily help you fix it…for a fee. If you don’t need this RDP connection open, close it up and leave it that way. Most users don’t need it to be open and should never allow remote access to any device unless it is thoroughly understood why it’s needed. It certainly should never be opened up for an unsolicited caller claiming to be able to help you with a problem you didn’t report. In addition, the latest SynAck attacks appear to be highly targeted with specific goals in mind toward enterprises in the United States, Germany, Iran, and Kuwait. An interesting mix of targets, indeed.